I wished I can sip a cup of cappuccino at a nearby coffee shop right now but I guess I have to forget it as I’m way too lazy to go out at the moment. It has been raining cats and dogs lately, and I’m stuck in the office with my works piling up. It’s almost end of the year, and there are tons of accounts to be done before dateline. I admit that I don’t like to be ‘jailed’ in the office as I always believe that the air-cond would leave to dryness. Yes. The air-cond can give dryness to the face, hands, and feet. For some people, the dryness could result in flaking, cracking, or even eczema. Dry skin. Nobody loves looking at their flaky skin, anyway. I feel you. Let’s talk about a nice body serum that would leave your skin supple, smooth, and hydrated. The one that would never let you feel as if you’re applying cooking oil on your body – sticky, and oily. How To Recognize A Dry Skin? Like lots of people, I often think my skin is oily until I went to my favourite beauty consultant to have facial, and body massage. Yes. I have combination skin (dry and oily) on my face, and a very dry skin all over my body. They even taught me how to check the dryness of the skin. Just scratch a small area on the arm or leg with fingernail, and if it leaves a white mark, then the skin is dry, and needs to be exfoliated and moisturised. Why It’s Important To Moisturise Skin? Believe it or not. Although water is good for the health and helps remove impurities as well as energizes the body; drinking water still does not help the skin to stay young looking because the average person’s skin does not reflect the amount of water being gulped. In fact, those who drink 10-12 glasses of water and go to sauna often suffer dehydrated skin. We often worried that our face would show the signs of aging, and forgot that our body also shows the signs of aging. The neck, and upper chest area is a very sensitive skin, and often show the signs of aging, sun spots, and wrinkles. Moreover, nobody loves having a dry skin especially with flakes. Some would skip wearing dark coloured outfits as others could spot the skin flakes, or you might skip wearing sleeveless because you don’t want to show off your dry elbows. So, moisturizing the whole body is important, not just on the face. I admit I hate looking at myself having this dry skin problem. Refreshing your skin and keep balance of moisture by Aqua Moisture Lock Body Serum. Not only formulated for light and unsticky feeling, quickly absorb but also locking skin moisture and softness. With benefits of Spring Sea Water, Vitamin B3, Shea Butter, Sodium Hyaluronate, and Collagen. Keep skin fresh, hydrate and look healthy when using regularly. 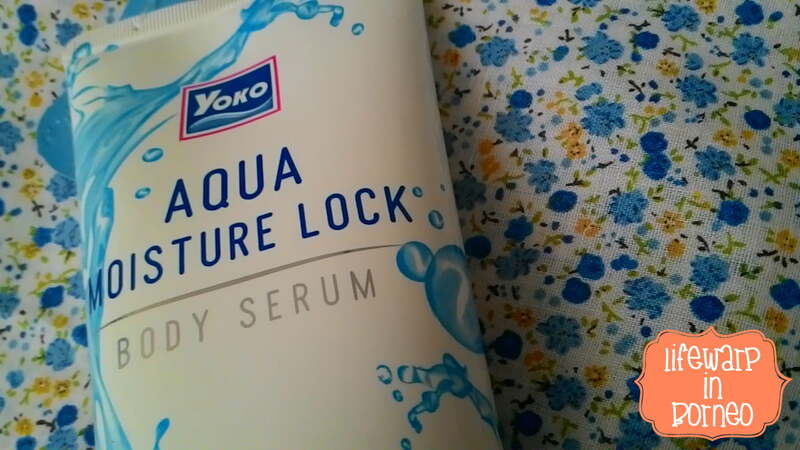 This YOKO Aqua Moisture Lock Body Serum claims to have Spring Sea Water, Collagen, Hyaluron, Shea Butter, and Vitamin B3. In short, this body serum has it all! Our body’s collagen production reduces as we get older in which can result in an increase of wrinkles and fine lines, and decreasing smoothness and suppleness of the skin. Thus, the Collagen functions as slowing down the aging sign by increasing the production of collagen. The Spring Sea Water is known as the healing spring water as it infused with natural goodness from beneath the earth’s surface. Most of the traditional spas in Europe practice Balneotherapy in which it is a treatment of disease by bathing in mineral springs. Vitamin B3 is known for its anti-aging properties, and it also boosts hydration to reduce redness. In fact, Vitamin B3 is proven to increase the production of ceramides and fatty acids, which promote the skin to be able to keep more moisture in. Shea Butter contains natural oils, and fatty acids which makes it incredibly nourishing and moisturizing for the skin. Shea Butter is often used to remedy dry skin as well as to help protect the skin’s natural oils. Hyaluron, on the other side, provides antioxidant defence against free-radical damage, and reduces inflammation. It can also improve the skin’s moisture content and at the same time strengthen skin’s barrier. 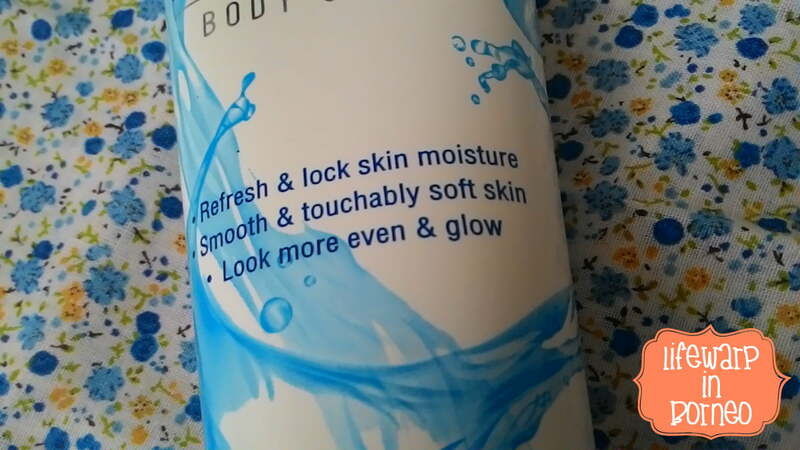 Frankly speaking, I haven’t find the best body lotion that retains (and lock up) the moisture. I tried after-shower body lotion before but ended up having a slippy bathroom floor. Sometimes, I would bump into a body lotion that is good at treating my dry skin but the awful scent is a real turn off. I gave most of them to my relatives and friends. Finally, I received this YOKO Aqua Moisture Lock Body Serum together with YOKO Hokkaido Milk UV Body Serum, and YOKO Milky Shower Cream from Natta Cosme. Thank you so much, Natta Cosme! The lid needs to be closed… tightly. The body serum comes in a 200ml blue plastic tube. 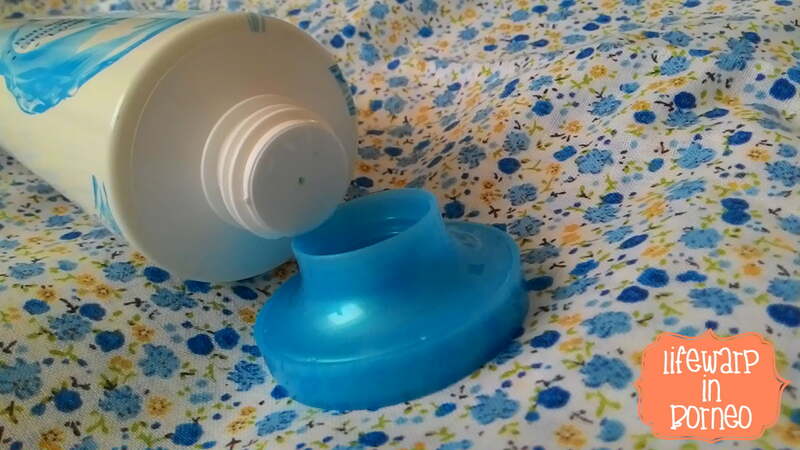 Very easy to squeeze out the serum, but the lid has to be tightly closed or leakage might occur. Unlike YOKO Hokkaido Milk UV Body Serum that has quite strong floral scent, this body serum has a very faint minty scent. If you like ‘almost-no-scent’, then this is the what you should have. It also has a very lightweight, non-sticky, and fast-absorption. I love the texture. Very lightweight, and has that cooling sensation. I usually apply this after I have my bath/shower in the morning, and evening. I layered it with YOKO Hokkaido Milk UV Body Serum, and other heavier textured body lotions as well as sunblock. I love the minty scent, and the serum does not leave any sort of greasy residue as it penetrates into the skin. Oh, I also feel refreshing cool sensation upon application. 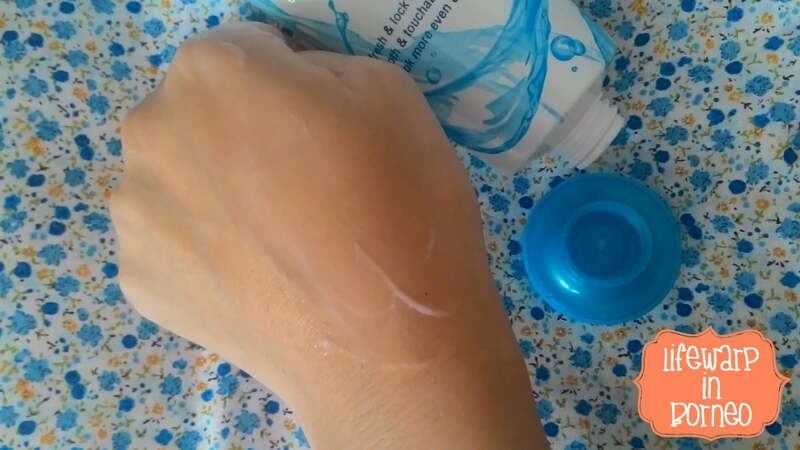 I also apply it on my face just to test whether it gives me breakouts or not. In fact, it gives me a smooth and hydrated skin. No breakouts. I have been using this for 2-week now, and I can feel my skin is getting really smooth, and hydrated. No more flaky skin. Sorry, pretties. I forgot to take the pictures of my dry skin before applying this awesome body serum. Anyway, I love this body serum, and it doesn’t disappoint me. It’s best to be applied shortly after having shower, when the skin is still wet. This body serum can be layered with other products, and you can actually see the result within 2-week, with constant application. 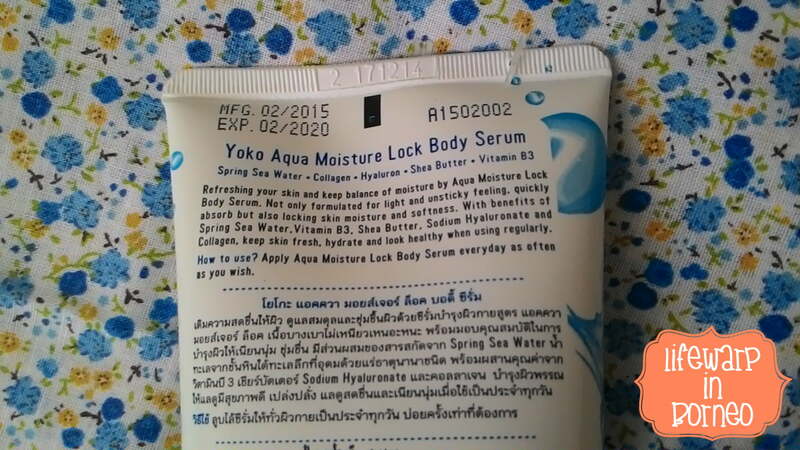 You should get one YOKO Aqua Moisture Lock Body Serum for yourself today, and you will get a mini spa salt for free. You can use the spa salt to exfoliate the dead cells before applying body serum for better results.